For a good portion of The Flash Season 1 Episode 16 it felt as if there may be few consequences to Barry's decision to stop events he had lived previously, despite Harrison's warnings. By the end of the hour, he had to be wondering whether he could go back in time again for another mulligan. The inclusion of the Rogues in this installment wasn't as seamless as it was in previous outings, but somehow the way their story wrapped up made up for it. Over the top acting can become really grating, but the finesse with which Wentworth Miller delivers his version of the cheesy performance always wins out. Snart made sense out of his scenes with our dear Cisco, inevitably pushing him to reveal the identity of The Flash, and then topped the arrangement with Barry about keeping his secret hidden perfectly by chuckling over the mention of the Rogues moniker and asking for a ride back into town. Here's hoping his chemistry with ATOM is as amusing on their spinoff. Once we stepped away from the titular portion of the episode, it was all about Barry immediately snatching up Mark Mardon before he could put his Weather Wizardry to good use. While it was difficult to blame him, it was also painful to watch him learn through experience what messing with the time continuum really means. It's probably easy to want to dismiss out of turn Harrison's warning. After all, people were seriously injured on Barry's watch and if he had a way to stop it from happening again, why not give it a try? Because every single action sets off another series of reactions and we often never take the time to see the correlation between them. The most glaring and easy to see was how differently Iris reacted to his suggestion she had feelings for him. Harrison pointed out the trauma that resulted from the previously lived day likely dislodged things in her psyche she didn't even know she felt. Without the benefit of that shakeup, she's still firmly grounded in her love for Eddie. 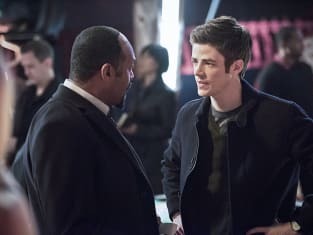 It was unclear whether Caitlin's explanation of "lightning psychosis" was supposed to explain all of Barry's outbursts going clear back to his feelings for Iris over Christmas or only insomuch as what resulted in Eddie going on the defensive, but if it means we lose goofy Barry with Iris, let's hope it's the former. Even if we're subjected to a man on a mission superhero without a love life, similar to his buddy Oliver over in Starling City, that's fine. Focus is good. There is time for a relationship to develop naturally, over time. It needn't feel rushed. Cisco didn't lose his life or cry in front of Harrison just before his heart was plucked gingerly from his chest, but we were treated to a speech from Harrison regarding how he feels about Cisco, Cisco did cry and the Reverse Flash did rip someone's heart out. Things change, and yet they also remain the same. There was never any doubt that Harrison (slash Eobard slash Reverse) cared deeply for Cisco and on any other day than one in which Cisco was digging into his motivations, Cisco would be safe. The life Harrison built as he's patiently awaited Barry to grow into his powers so he could use them to get back to his time (I think) is real, and yet also patently false. Harrison is probably as torn about it as we are at this point. Mason never got the story out to Iris and because of that Cisco and Barry never chatted and things stalled. For now. While Mason was onto the story of this century before he was whooshed away by Eobard, Barry does recall the first conversation that made him instigate the chat with Cisco, combined with Joe's suspicions. The investigation into Harrison Wells is only just beginning, and since Barry knows he has the ability to go back in time and Harrison appears to know just enough about it, perhaps he'll start to put the pieces together as Cisco did, leading him straight to Reverse Flash. Harrison is so much smarter than everyone else, though, and has Gideon to check in with as to whether any actions in the present are changing the future. One false move in the present and he'll know they're onto him again. The implication that Barry knows time can be changed, and most likely has been changed before, opens up a lot of possibilities. In our The Flash round table, we talked about what we witnessed in The Flash Season 1 Episode 15 that we thought might remain in tact, but we never imagined who might be lost if Barry decided it would be better to live the day differently. Rationally, it's easy to understand how circumstances dictate our responses to situations. Watching it play out was unexpected and surprising. As it turns out, I wouldn't have wanted Barry's first foray into time travel to have gone any other way. What did you think of "Rogue Time"? Were you surprised at Iris' reaction to Barry's suggestion they just walk off into the sunset together? What about Mason's demise? 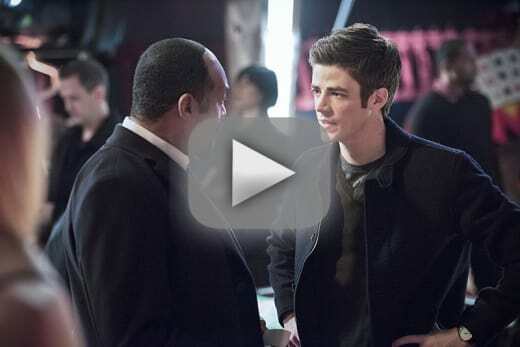 Hit the comments and if you need to see it all again, you can watch The Flash online via TV Fanatic! Make sure you're here next week when we run down The Flash Season 1 Episode 17, "Tricksters," because who can't wait to see John Wesley Shipp and Mark Hammill reunite?! The Flash Photos from "The Tricksters"